Marion N. Seidel’s equestrian journey has traversed two continents, and spanned nearly four decades. Born in Düsseldorf, Germany, her love of horses drew her to the race track and as a teenager Marion became an apprentice jockey. For sixteen years she poured all of her love and passion for the majestic animals and racing, also known as “The Sport of Kings” into her work. In 1992 Marion made a move to Florida and continued working in the field as an exercise rider. It was then that she was presented with a stark contrast of ideology between her home in Germany and of Europe as a whole, and how the Thoroughbred Horse Racing industry was run and operated in the United States. She was confronted with an astounding amount of performance enhancing medication administered to the animals, as well as drug use, and abuse forced upon them by the trainers. Training methods that were taboo in Europe were commonplace in the U.S., and Marion became disenfranchised with the entire structure of the industry. In 1995 she made the decision to step away from the sport and from the animals she loved because she couldn’t reconcile what she saw as abuse. In 2011 Marion earned her Thoroughbred Trainer's License and opened the door for private ownership. It was also the time she felt moved to share her story and lifetime of experience with the equestrian world. Marion has penned three novels since 2013. ‘Just Another Race Horse’ , ‘Race Horse Training: Compared’, and ‘From Race Horse to Trail Horse and Pet’ were all published within a year of one another, and showcase the knowledge and insight Marion has earned over forty years of working with the animals she loves. Marion has become a champion for Thoroughbred Horses and continues to work with, and care for them today. She hopes to raise awareness and garner compassion for the beautiful animals being abused every day, simply for the entertainment of race fans. Marion’s next novel (Title and Release Date-TBA) is in production and promises to once again showcase her passion for, her love of, and her knowledge about Thoroughbreds and the industry many of them in the United States are trapped in. From Race Horse to Trail Horse and Pet by Marion N. Seidel is the story of Billy, a thoroughbred gelding who started his life as a racehorse and then became a trail horse and pet when his racing career ended. Told from Billy's point of view, From Race Horse to Trail Horse and Pet details Billy's uncertainty of his training to be a racer and the anxiety he faced thanks to training that started at a young age and the performance drugs and feed given to help him perform. When Billy's career ends, he finds himself scared and uncertain as his routine changes and he finds himself alone and in a new home. Billy then finds a new friend that helps him adjust to the new routine and life as an ex-racer. When things change again and Billy finds himself alone and in pain, his friend steps in and takes him to a new home and helps him adjust and learn to be happy as a trail horse and a pet. From Race Horse to Trail Horse and Pet by Marion N. Seidel is relatively well written and the author has great imagery and puts the pictures of Billy in the right spots to help you picture what Billy is describing. I smiled and laughed at Billy's accomplishments and wanted to cry when Billy told of the pain he was in. 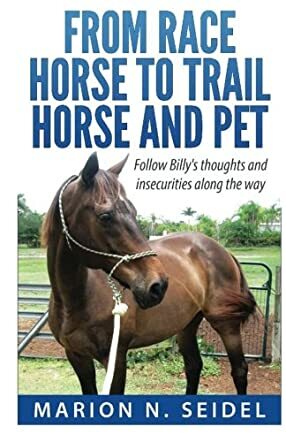 Being written from Billy's perspective makes From Race Horse to Trail Horse and Pet unique, but I think it could have been better written from the perspective of Billy's owner with excerpts from Billy throughout. However, this is an amazing read. I give it a 5 star rating,even though I haven't bought it yet,I know Marion has put all her love for Billy Jones in to telling his story,can't wait to get it.